The vast grasslands of East Africa support the largest concentration of wildlife in the world. Over 12 days you’ll get among the massive herds and their predators in an overland truck and 4×4’s with our expert local leaders at the helm. 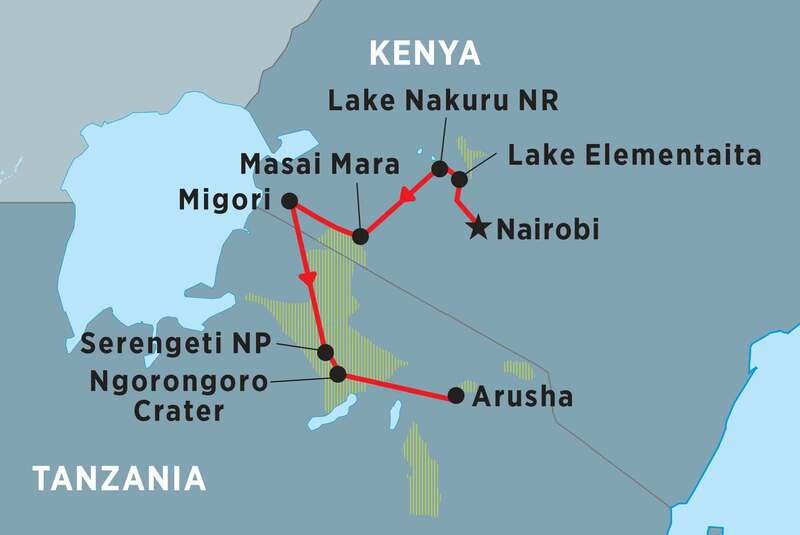 From Nairobi, travel to the waters of lakes Elementeita and Nakuru, then take in quintessential, breath-taking Africa in the Masai Mara, the Serengeti, and the magificent Ngorongoro Crater – all filled with iconic vistas and animals. Enjoy plenty of included game drives and walks to spot the local inhabitants – lions, cheetahs, elephants and more. There is nothing quite like staying in the heart of these incredible national reserves, returning to a welcoming camp after days exploring the plains with guides who have grown up on this land, and falling alseep to the sounds of east Africa. This is an unforgettable journey.